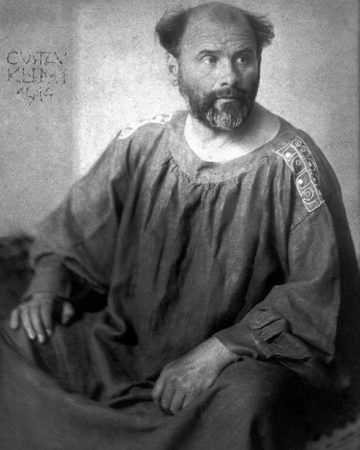 Klimt an Austrian symbolist painter and one of the most prominent members of the Vienna Secession movement. 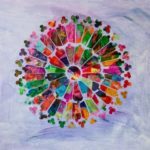 Klimt is noted for his paintings, murals, sketches, and other objets d’art. Klimt’s primary subject was the female body, and his works are marked by a frank eroticism. In addition to his figurative works, which include allegories and portraits, he painted landscapes. Among the artists of the Vienna Secession, Klimt was the most influenced by Japanese art and its methods. Klimt lived in poverty while attending the Vienna School of Arts and Crafts (Kunstgewerbeschule), where he studied architectural painting until 1883. He revered Vienna’s foremost history painter of the time, Hans Makart. Klimt readily accepted the principles of a conservative training; his early work may be classified as academic. In 1877 his brother, Ernst, who, like his father, would become an engraver, also enrolled in the school. The two brothers and their friend, Franz Matsch, began working together and by 1880 they had received numerous commissions as a team that they called the “Company of Artists”. They also helped their teacher in painting murals in the Kunsthistorisches Museum in Vienna. Klimt began his professional career painting interior murals and ceilings in large public buildings on the Ringstraße, including a successful series of “Allegories and Emblems”. All three paintings were destroyed by retreating SS forces in May 1945.